Bells and whistles, or effective methodology? Best in marketing, or best researched? You choose! How many times have you heard something like this: “I took Spanish for two years, but I can’t speak a word?” Why do traditional methods produce so much frustration? Why don’t more people excel in foreign language study? After all, we seem to have no trouble picking up our first language! 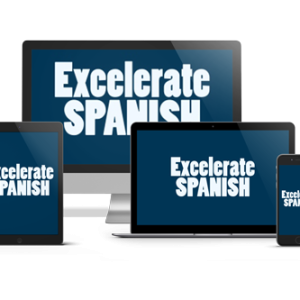 Excelerate SPANISH works because it duplicates the conditions that foster language acquisition. New words and phrases are clarified by English, leaving no room for ambiguity. Gestures and motions act as “concrete stimuli,” helping students to internalize the Spanish vocabulary and structures. Everything is embedded into meaningful contexts to make your experience fun (as it should be!) and to aid your retention. Then, to help you to get plugged into many more outlets for continued access to resources and practice, there’s the Excelerate SPANISH page on Facebook. Visit it often for links to videos, ebooks, news in Spanish, even resources to help you chat with native speakers. 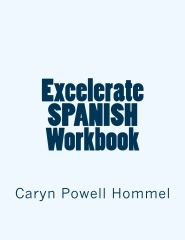 Caryn Hommel, homeschool mom and author, earned a degree in Spanish Language and Literature from North Carolina State University and taught Spanish in public schools for ten years. Her successful experience with Total Physical Response (TPR) and Total Physical Response Storytelling (TPRS) motivated her to develop a unique DVD-led curriculum to help other homeschoolers to benefit from wonderful, brain-friendly approaches to foreign language instruction. She has also designed and implemented an ESL curriculum, led educational tours of Spain and Mexico for high school students, and presented to the Foreign Language Association of North Carolina and the Johnston County Second Language Network. Caryn assists families in the homeschool community by offering private and co-op classes, conducting free seminars, and speaking at homeschool conventions. The Hommels have homeschooled since 2003 and have graduated two students. She continues to teach her younger two children, and thinks that celebrating life and learning as a family is the most fulfilling way to spend your days! Please use the Contact Form to email Caryn directly. If you do not see a response within a few hours, please check your Spam folder. If you would like to have Caryn call you, please include your phone number and time zone. Thank you!